Paul Werstine: Early Modern Manuscripts and the Editing of Shakespeare. This is the most important study of textual editing of early modern English drama since W.W. Gregs The Editorial Problem in Shakespeare (1942). 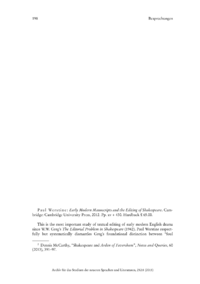 Paul Werstine respectfully but systematically dismantles Gregs foundational distinction between foul papers, or authorial drafts containing loose ends associated with early stages of composition, and promptbooks, the regularized and/or revised copies of those drafts used to guide acting companies during stage performances. Both kinds of manuscript served as copy for printers who produced volumes such as the First Folio of Shakespeares plays (1623). But since only 21 of these playhouse manuscripts survived into the twentieth century  out of the thousands of plays written and performed in the period and the hundreds that reached print and still exist  Gregs range of reference for inferring the characteristics of foul papers and promptbooks hidden beneath the printed versions was limited. Discovering as much as possible about these manuscripts was desirable because it would allow editors to explain and correct anomalies in the printed texts, and to recapture, it was hoped, Shakespeares original intentions. Werstines lucidly detailed analysis shows that the evidence of the surviving manuscripts does not support Gregs seminal concepts.